I love going to Woodberry Kitchen. I love that I can order small snacks like popcorn and deviled eggs. I love that they buy a lot of their produce and meat from local farms. I love that they make their own ice cream and it’s always ALWAYS fabulous. And I love that I am always happily full when I leave. This review is a little old, as I went a couple of months ago but I think most of what I wrote down will still be relevant. One thing I have to say is that if you ever want to go to Woodberry, it’s REALLY important to make a reservation. That place is ridiculously crowded all the time so it helps to have a set time to go. Also, don’t expect to sit immediately even if you had made a reservation- this place is just WAY too popular for that. In fact, when I went there they were taping a segment for Ace of Cakes so I got to see Duff Goldman and his crew (which was kind of surreal for a Food Network junkie such as myself). We ordered the popcorn for $1 to start, mainly because Dan loves it. 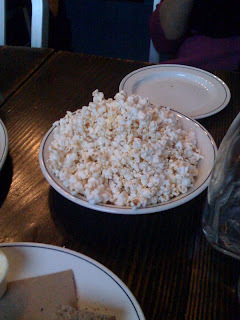 The tiny kernels are perfectly salted, and they were a nice distraction as I waited for my food. For a “real” appetizer, we tried their flatbreads. I remembered that I loved one of them the last time we had come. 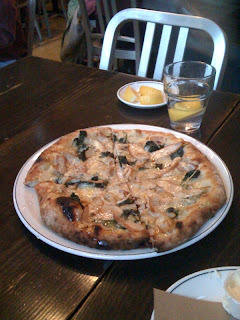 We got the smoked chicken, spinach, cheddar and local honey flatbread for $12. This was amazing. This was DEFINITELY enough for a meal and a half. The smoked part of the chicken really stood out and made the flatbread something different. It also helped that the honey wasn’t overbearingly sweet but intense just the same. The spinach and cheddar were a nice addition, but take a back seat to the chewiness of the bread and tang of the honey. I was probably full at this point, but I couldn’t wait for my Stout Braised Short Ribs served with toasted faro, mushrooms and spiced rutabaga ($24). This meal was delicious, I’m not going to lie, but the ribs were a bit too burnt on the outside if you asked me. However, the meat was really tender and wonderfully spiced, though not overly saucy which allowed me to taste the meat that much more. The faro reminded me of wild rice and the rutabaga looked liked butternut squash but tastes hard and crunch almost like a radish bred with a carrot. Overall though, those took a back seat to the meat. Dan ordered the Roseda (yay!) ribeye with sweet potatoes ($31). For that price I was expecting unicorns to fly out of the meat (I don’t go out to fancy restaurants often), and the meat was very juicy and flavorful. I just couldn’t stop thinking that I wanted to taste something different for that price though. The sweet potato fries were presented really well- in a cone, but they weren’t soft and mushy. Dan really liked his meal. 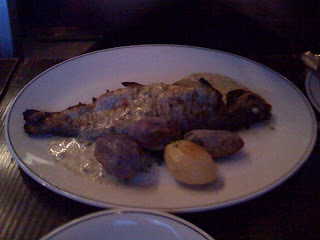 My mum got the Rainbow Trout which came with mushrooms, spinach, roasted potatoes , caper aioli and lemon ($19). My mum absolutely loved this meal and polished it off with a zeal that made me happy. The fish itself was great and not too “fishy” although it looked fishy enough because the entire fish was on the plate- beady eyes and all. I would never have been happy with that, but my mum wasn’t phased in the slightest. By this time, I was beyond satiated—but I couldn’t NOT get dessert! Not at Woodberry Kitchen! I decided to go for the praised ice cream which is $6 for 3 scoops. I chose the Beet Cardamom, Vanilla and Brown Sugar. The Beet Cardamom was light pink in hue and had a delightful mix of both flavors- neither of them overpowering the other. Although it was definitely an unusual flavor, I really loved them together—they were definitely MILES better than the Olive Oil ice cream I had tried at Woodberry the last time (GROSS). The Vanilla was my all time favorite. It’s so creamy and fragrant- just a wonderful soothing ice cream, nothing pretentious, just perfect. The Brown Sugar reminded me a bit of Dulce de Leche and since it’s important for me to rank things, this was my least favorite but that’s not saying much. Dan chose the get the Braeburn Apple Pie with vanilla ice cream, caramel and cinnamon. OH man! How does Dan ALWAYS know which desserts to choose. The crust was great, as well as the topping. The apples were cooked perfectly and not doused in sugar. Overall, we had a wonderful time. The food was really pretty amazing, and the building itself is such a treat to be in. The one thing about this place that annoys me is that they really try to pack people into the space- so tables can be VERY close together. It’s also a very loud place with lots of people at the bar (which surprises me). I feel like this is one of those places that you just have to try if you live in Baltimore. Give it a few years and it’s definitely going to become a Baltimore Institution. Finally! I finally went to the heavily talked about gelateria (did I make that up?) in Fells Point. Located right on Broadway, it’s in a pretty fabulous location- and I’m not surprised that it’s doing so well ever since it opened a couple of years ago. People also love it because it uses organic ingredients, local ingredients, and just really good quality ingredients for every single one of their flavors. I excitedly ordered a regular sized cup filled with half strawberry sorbet and half Madagascar Bourbon vanilla. The sorbet was EXCELLENT. The strawberries came from Pennsylvania and it really did taste fresh! It was a thick sorbet, not at all runny or over-icey. The vanilla itself was mild and pleasant. Don’t get confused about the name like I did, Madagascar Bourbon vanilla is a type of vanilla and it does not taste like the liquor! The combination of both the sorbet and gelato was incredibly refreshing for a hot summer’s day. I also tried the spicy chocolate that’s made with red pepper flakes- it was definitely novel, but I’m not sure how much of that I would be able to take. The chocolate hazelnut was very good, but very rich, in fact much of their chocolate gelato was very rich- and I wasn’t in the mood for that type of dessert while walking around in the heat. Overall, I was very impressed. The only thing that was hard to swallow was the price- $4.75 for a regular cup. That’s pretty steep if you ask me. However, I do understand that the price is indicative of the quality of ingredients. I would definitely go back again, but I say this only because I do not frequent Fells Point very often, and therefore wouldn’t mind the splurge. There's something about Mt. Washington that is so charming. Sulgrave Avenue is home to a couple of great restaurants in Baltimore (Ethel and Ramone's being one of them), and so it surprised me that it felt so quiet on Mother's day! In fact, Crepe du Jour was the only place open on that street that day. Luckily for me, that was where I wanted to go. My parents and I sat on the back patio which would be perfect for a summer lunch of a couple of crepes and maybe a nice glass of wine. We decided to share (which made me VERY happy!) and ended up choosing 2 savory crepes and one dessert crepe. We chose La Napoleon ($10) which came with sauteed mushrooms, artichokes and brie. Now this was great- the combination of the three were fabulous! I thought the brie would overshadow the other two ingredients, but not at all. The second crepe was the Crepe Paysanne ($12) which came with chicken, cream sauce, broccoli, mushrooms and tomatoes. Oh man, super decadent! It was also thicker and more substantial of a crepe than La Napoleon (which doesn't mean better, just more substantial! I loved them equally!). The cream sauce was perfect and went really well with the chickens and mushrooms. Both were great choices. And now onto the dessert crepe. Oh I was excited about this. I, of course, had to get a crepe with nutella because I consider it a waste of calories if a crepe does not include that delicious hazelnut confection. We ordered the Mount Washington ($10) which was SPECTACULAR! I was literally scraping the plate with my fork to make sure every ounce was eaten. The crepe itself came with strawberries, caramelized apples, whipped cream and nutella. Heaveeeeennnnn, I'm in heaven..... I LOVED the addition of the caramelized apples- it made the crepe into something extra special. What a great end to a meal. Overall, I was RIDICULOUSLY happy with this restaurant. I would love to come back again and try more things on their menu! It also made me realize how lucky I am that I have Sofi's Crepes near where I work and Crepe du Jour near-ish to where I live. Baltimore is apparently for crepe lovers like myself! Please check this place out!!!!!!!!!! Every Friday through September Mars is giving away 250,000 coupons for free chocolate. The coupons will be mailed to you and they can be used for M&Ms, Snickers, Twix, 3 Musketeers, Milky Way or Dove. The coupons will be available starting at 9:oo am EST. Just click here to sign up. Limit 4 coupons per household throughout the entire promotion. Something happened to me recently, and I am not sure how to resolve this in my head. I don’t like margaritas anymore. There. I said it. This ridiculous phrase that CANNOT be true- but it is. I don’t like them. The past two times I’ve had them I actually wanted to throw up, and no it’s not because I had too many of them. So imagine my sadness when Dan wanted to go to Chili’s (as mentioned earlier, one of his favorite restaurants……I know…..I don’t understand it either) and the only redeeming quality about that place, was now NOT going to be part of my meal. So I settled into a booth next to one of the most annoying humans on the planet who talked entirely too loud about his political views (of which I did not agree, so that made him worse) and I drank bland water and ate a ton of chips. I ordered the Crispy Chicken Bites meal for $5.99- I can’t complain about that. My meal consisted of two tiny sandwiches and some fries. The sandwiches were horrible. The crispy chicken part was good, but the spread was weird tasting and they also put a pickle on the sandwich, and therefore the juices soaked into the bread and created another weird taste. Oh well, at least it was $5.99. I also didn’t eat their fries, mainly because I had way too many chips with guac. I’ve been to Michael’s a number of times since it’s one of Dan’s favorite restaurants. What I love about this place is that it offers a large variety of entrees with a range of prices. If you merely wanted to come here and get a sandwich for a reasonable price- go right ahead. But if you feel like eating some amazing seafood to celebrate a nice promotion- this is the place for that as well! Their seafood is incredible, especially their crabcakes. I hope they are well known throughout Baltimore, but I doubt it. When I went to Michael’s recently, I was on a salad kick so I decided to get the Caesar Salad with Blackened Chicken. I love their Caesar Salad because they don’t drown it in dressing- there’s always just enough. The blackened chicken was a little too overwhelming - I wish they had toned down the spice a notch. All in all, it was a pretty delicious salad though. Dan got the crabcake and was very happy of course- there is never a lot of filler in their cakes and it usually comes with big hunks (chunks?) of crabmeat. All in all, Michael’s is a great place for a nice dinner where you don’t need to worry about breaking the bank- but you can if you want to! I feel kind of ridiculous writing about Chipotle, but it has come to the point where I must. I tend to have very short-lived obsessions. I go crazy about something for a good two weeks, and then all of a sudden I couldn’t care less. Right now my obsessions are: Adam Lambert and Greek Yogurt. I don’t want either of these obsessions to end, but alas I know they will. However, one obsession that has been constant since college is my love for Chipotle. I love it. I love their rice, I love their guacamole, but most importantly I love love love their Barbacoa- or spicy shredded beef. Here is my ideal Chipotle meal: a burrito bowl with rice, black beans, barbacoa, salsa, sour cream, cheese, lettuce and guac.